While it may seem clich?, I’ve always enjoyed the proverb advising that “when life deals you lemons, make lemonade.” The phrase was my first thought when I saw a recent story out of Ethiopia about Azmarew Zeleke’s burgeoning coffee business; in this case, replace “lemons” with “spent mortar shells” and “lemonade” with “coffee machines”. It may not have the same ring as lemons-lemonade, but you get the idea. 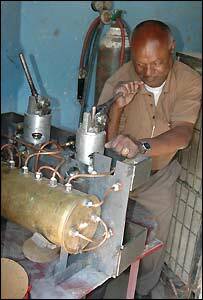 Cafe owner Haile Abraha bought one of Mr Azmeraw’s machines a few months ago. This story has a bit of everything: domestic production that undercuts expensive imported technology, local job creation, and most of all, innovative use of the materials at hand. And, of course, a bit of proverbial advice thrown in for good measure.